[Coverage] Press Conference of《TVB馬來西亞星光薈萃頒獎典禮2014》 TVB Star Awards 2014 Nominees List Announcement! Kuala Lumpur, October 2014 – 《TVB馬來西亞星光薈萃頒獎典禮2014》TVB Stars Awards 2014, the awards show regarded as the prelude of TVB《萬千星輝頒獎典禮》, will be held on 23rd November 2014 (Sunday)! Anyway, our team from wljack.com & loong-updates.blogspot.com have been given a chance to do a coverage on the press conference of 《TVB馬來西亞星光薈萃頒獎典禮2014》nominees list announcement a few days ago! Press Conference of《TVB马来西亚星光薈萃颁奖典礼2014》Nominees Namelist Announcement! Press Conference of TVB Star Awards Kicked Off! The press conference held was attended by the three prominent artistes from TVB including Linda Chung, Roger Kwok and Kristal Tin. All of them have been a notable figures from TVB whereby Linda Chung won the best leading actress award in Malaysia TVB Star Awards last year, Kristal Tin won the best actress award in Hong Kong TVB《萬千星輝頒獎典禮》last year while Roger Kwok was a two times best actor in TVB《萬千星輝頒獎典禮》! The event will be organized by TVB娛樂新聞台, Astro as working partner while MY FM & MELODY FM as media partner. It will be live broadcast on TVB Entertainment News (Channel 313), Astro Wah Lai Toi (Channel 311) and Astro Wah Lai Toi HD (Channel 310). The awards ceremony will be based on the votes of the Malaysian audiences corresponding to the slogan of “心水視帝視后由你揀”. So Malaysian audiences, do vote for your favorite actors, actresses, drama and etc! During the press conference, all three of the artistes have shared with the media members regarding the awards as well as their current news. Roger Kwok, Nominated For My Favourite TVB Actor In Leading Role! “Come On Cousin老表,你好Hea！” is currently the latest TVB drama on air and Roger Kwok is the main actor for the drama. He hopes that the drama can bring a lot of laughter and joy to the audiences during the upcoming 20+ episodes. Besides, he mentioned that not every TVB artistes get the chance to come over to Malaysia that often. So he is very happy to be able to attend the event in Malaysia and he hopes that everyone can support his nominations in “My Favourite TVB Actor in a Leading Role” as well as “My Favourite TVB Actor in a Leading Role”! Malaysia Is Something Like 2nd Home To Linda Chung! Upcoming Concert in Genting! Coming over to Malaysia for 5-6 times this year, Linda Chung said that Malaysia is like a 2nd home to her. One of the main things she like about Malaysia is the food here! She enjoyed the “Claypot Lou Shu Fun” which they have eaten when they arrived here that day. She also looked forward to try the “五指山榴莲” as suggested by Kristal Tin! Kristal Tin knew about this type of durian from her friends as well as from her husband Chapman To who has been here in Malaysia for quite some time during filming of his movie here! Apart from this, Linda Chung also shared about her recent drama in All That Bitter Is Sweet 大藥坊. It was a challenge for her because this was the first time for her to act as a Traditional Chinese Medicine practitioner. She has to memorize a lot of dialogues when acting that role. The latest drama, Tiger Cubs 2 also features her in it. Her role in that drama was totally different from those in which she has acted before. She wished that she could be nominated for the character in Tiger Cubs 2. Besides this, she also promoted regarding her upcoming concert in Genting Highlands! Kristal Tin will be there as the special guest for her concert! Kristal Tin Grateful For Her Role in “Black Heart White Soul”! Malaysian food was also one of Kristal Tin’s favorites in Malaysia! She mentioned that she likes Malaysia for the food as well as the weather here. During the press conference, she said that she was very lucky this year for receiving the role as May Tam in “Black Heart White Soul忠奸人”. 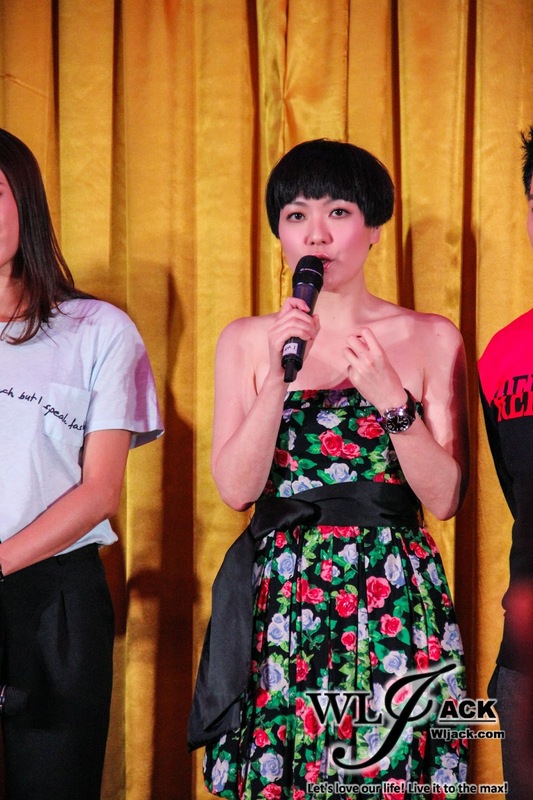 Winning an award last year via her role as Chan Kai-Ying (Shrewish Ying) in Brother’s Keeper, she scared that the audience will fixed their impressions on her as being a shrewish character. She was glad that May’s role in Black Heart White Soul didn’t remind the audiences of Chan Kai-Ying and she was happy that the drama has received positive remarks from the audiences. In addition, she also joked that “Zhong Gan Yan supports Zhong Ga Yan! Zhong Ga Yan supports Zhong Gan Yan”! (Zhong Gan Yan = pronunciation of Black Heart White Soul in Cantonese. She hopes that the fans in Malaysia can support both Black Heart White Soul Nominees and Linda Chung in TVB Star Awards 2014! Linda was asked on whether she is confident to win the awards of “My favourite TVB Actress In Leading Role” again this year. She replied that she has done her best in her role and it’s all up to fate now. She have confidence but she’s not desperate for it. With her participation in the recent dramas All That Bitter Is Sweet and Tiger Cubs 2, they have boosted her confidence a little. The nomination list was announced to the public on 24 October 2014. Fans will be able to cast their votes for their favourites from 24 October to 16 November at www.tvbstarawards.com.my. For more information, please visit www.tvbstarawards.com.my.